Roger Español, the man who lost an eye after being shot with a rubber bullet by Spanish police during last year's independence referendum, is being investigated by a judge for having thrown a fence at agents. His summoning has caused outrage on social media, as Español was seen as the face of the result of the police violence that took place on that day. Also involved in the investigation are 13 more Spanish police officers for their conduct during their vote, specifically at a Barcelona school used as a polling station. Videos show aggressive behaviour on part of the police against people trying to cast their ballot. Civil lawsuits were filed against them. In addition, five other police officers are being investigated. They are are seen on camera punching and kicking voters as they forcibly remove them from a stairwell, with one woman roughly dragged down the stairs. The judge overseeing the case said that, based on police reports, testimonies, and film footage, "there were various shots of rubber bullets fired, 13 in total, according to the delivered police report," at the school. In that moment, the crowd prevented police vans from being able to move. One of the shots fired "directly hit Roger Español in the face." "Images can't be seen of the number identifying the agent who fired the shot," a spokesperson clarified. Despite this, the judge accepted the prosecutor's petition to summon Español to be investigated as well as the police officers. This, because "in a determined moment before he suffered grave injuries, he threw a metallic fence at one agent and also kicked one of the fences, which hit an agent from behind." 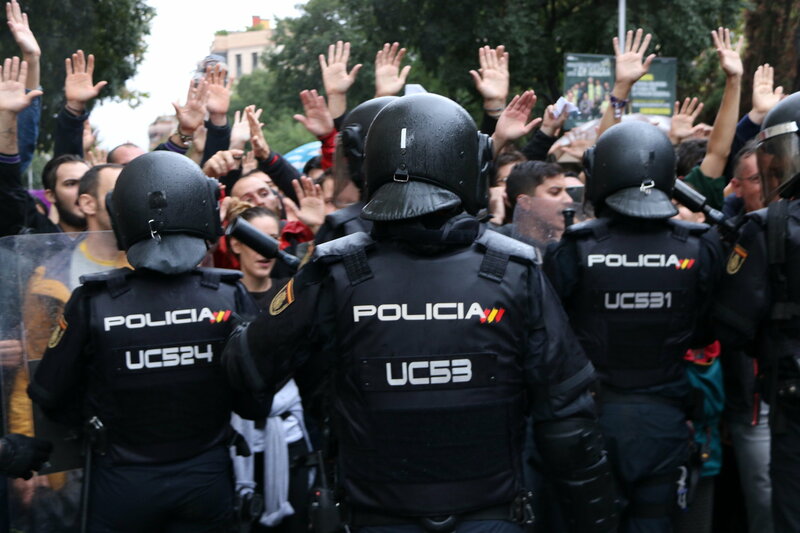 In November, Español filed a complaint against the Spanish police. According to compiled images, the officer would have aimed directly and shot him from about 15 meters away , a prohibited practice by some police protocols. That’s why the complainants demanded criminal responsibilities for the officer who shot the rubber bullet and for the two chiefs on the ground. In addition, they asked politicians to take responsibility. Human rights organizations and the Barcelona City Council will also be presented as civil parties. Roger Español wants to be the last person wounded by rubber bullet in Spain and has filed a complaint in order to prohibit them, as Catalonia did in 2014.